So as of 28 June 2006, "What has taken six years?" I expect you might be asking. Well, then it seems there is need of a little history lesson as to how LFSF came about. LFSF gets its heritage from Lueck Data Systems (LDS) which was founded in 1987. The original focus of that organization was to assist Small and Medium sized Businesses (SMB) with the PC revolution which was sweeping the world. For SMB's, frequently they had no or very little IT related staff in-house, so LDS met that need. Then in 1995 a vision is born to manage the software on computers in a radically different way than the rest of the IT industry was doing it. 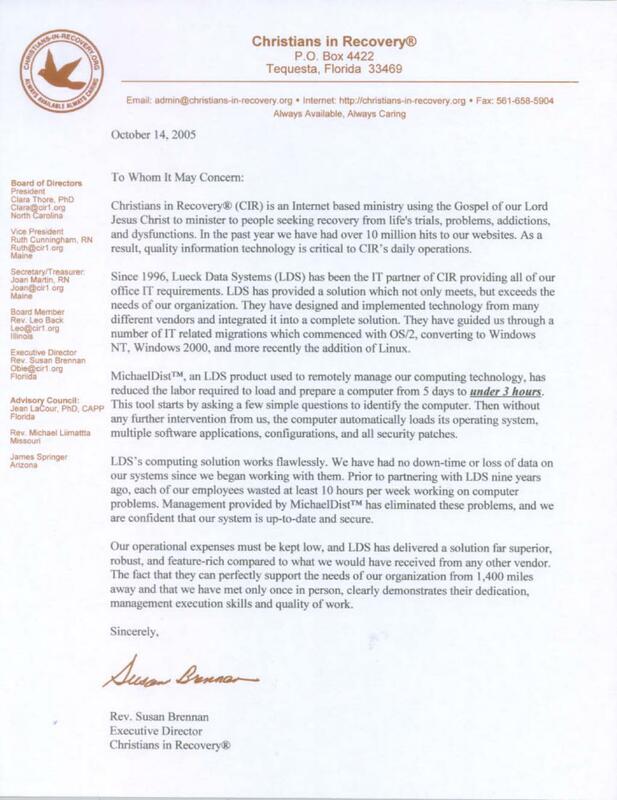 Thus the birth of Electronic Software Distribution at LDS, unknowing that a very few other companies were also working with this type of technology. Time goes by, multiple generations of Electronic Software Distribution are developed, some of those third party technologies are also utilized by the team. Yet, IT systems in this world just are not getting any better as a whole, the SMB market is ignored and undeserved more than ever... "something must be done!" I approached the client / employer which was buying 100% of my time at that time to look into making an external service out of the organization's IT services. I patiently waited, kept asking... they were bent on keeping IT as a cost based part of the organization, not a profit based part. So in March of 2000 plans began to be developed of how to create an IT company that would be the IT department for SMB clients. As it turns out, that plan flops royally... about like the Titanic! There are a number of wars to fight with that course of direction... we needed to learn that and understand those issues very deeply... that all takes time, yes? So what are these wars, and how did they help shape what is emerging as LFSF? Right at the top of this list... this world has little interest in quality. This world has the attribute "cheap" pumped down its throat with millions, if not billions, of dollars worth of advertising yearly. The concepts "cheap" and Computing That Just Plain Works™ war against each other. It breeds a common line of thinking, "What can I take out of this thing and yet have it still work?" That line of thinking is not compatible with delivering zero down time, hacker proof networks, data never lost due to technology failures. Then there is the problem that people want to own all of their stuff. Well, the only way we could be the IT department for lots of little SMB clients and bring them world class technology would be to own the licenses to much of the IT infrastructure related things. The only way to pull this model off is to be a sort of Robin Hood in the IT world... take the good tools positioned only to large organization, and sub-let those tools out to each of our clients. Thus, they do not own it. It is a Managed Computing Service, and if they do not pay their monthly bill, they loose their computers. Quite frankly we are not up to having wars like that with the people we are trying as hard as we can to serve. No one is truly happy, no one truly wins... it is just all about the money. Thus we arrived at the realization that we could not rely on licensing products from vendors. Period. We could not require it of those we serve either. (For one excuse or another, they would not end up with the same exact software we were innovating with, thus the solution would not be easy to replicate across countless organizations.) The only possible solution was to head off down the Open Source Software / Free Software (OSS/FS) path. For the software, and the intellectual properly. Thus, that really ticks off Venture Capitalists (VC's) which are there to make a 1000 fold or more return on investments which actually pan out... and we were not playing this game intending to fail. Thus, VC's would expect a huge revenue to capture profit from. No! These talents are not "for sale" to become some patented technology, the control and exploitation of which to be fought over by rich organizations. That is not its purpose, so... Non Profit Organization here we come! So the direction of how to bring the dream of Computing That Just Plain Works™ and the technology behind it to the entire world has spun around 180' in the course of the six years. Today the focus is on developing software and intellectual property on how to administer IT systems as efficiently as possible. There is a huge emphasis on "develop once, deploy many" in how we design the software and intellectual property. "Click, click, click" is not efficient IT administration... but that is the very technique the entire IT industry leverages. We go deeper than "click deep" here at LFSF. We figure out how to capture and leverage the knowledge behind the click so that countless others can reap the benefits of what someone knew how to click without having to click it for themselves. And there you have it... a tiny glimpse of some of the mile markers along this twisting and winding road from my own personal perspective.